Basic service provides for one container of garbage collected once every two weeks. 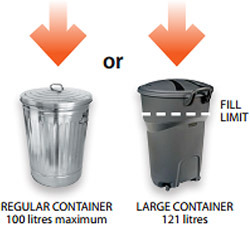 The volume of garbage in the container may not exceed 100 litres or 22 gallons in volume. For the safety of collection crew, weight of garbage per container is limited to 23 kilograms or 50 pounds. 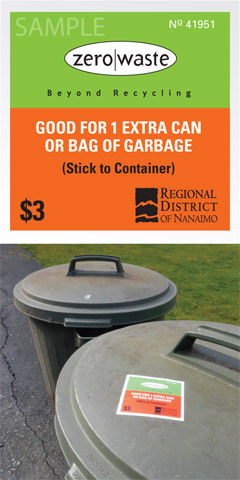 The one-can garbage limit or basic service makes individuals responsible for the cost of the garbage they generate, and encourages waste reduction and participation in the green bin food waste collection and curbside recycling program. This has contributed to our success in diverting waste from the landfill. By participating in the green bin and curbside recycling program the vast majority of our customers can easily accommodate the one-can limit. Unsure of where it should go? Please call 1-877-607-4111 or use the What Goes Where look up tool. Oversize items exceeding two feet in any dimension. Highly flammable materials, hazardous wastes, containers of liquids such as cooking oil or motor oil. Products such as batteries, paint, pesticides, and electronic equipment collected at depots. Grass clippings, yard and garden waste. Food waste (place in the green bin).